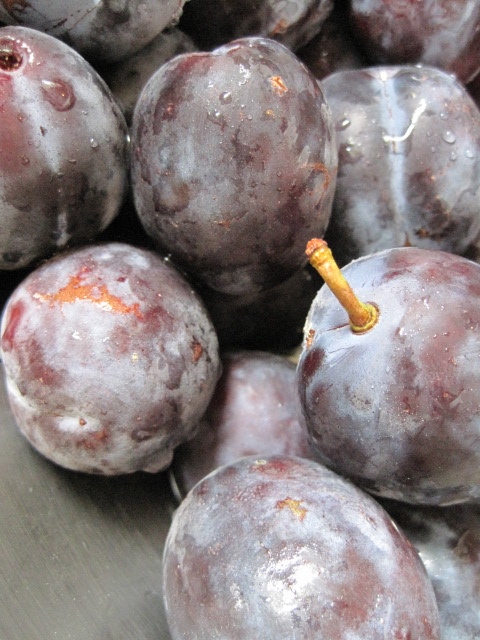 Prune plums, also known as Italian plums, Fellenberg plums, and quetsche, are in season, fleetingly. With this year’s weather problems that affect stone fruit set in the orchards ’round these parts, they’re small both in size and number. But if you can get your hands on them, they’re a great beginner jam, and make a beautifully colored jar of late summer. Prune plums grow quite well in Western Oregon (when our weather cooperates), and you might even have your own backyard tree. A beautiful black-blue with a significant bloom, the Fellenberg is a delight; a local varietal, the Brooks prune plum, is almost as good. The flesh is relatively firm in these sweet, dense little nuggets. 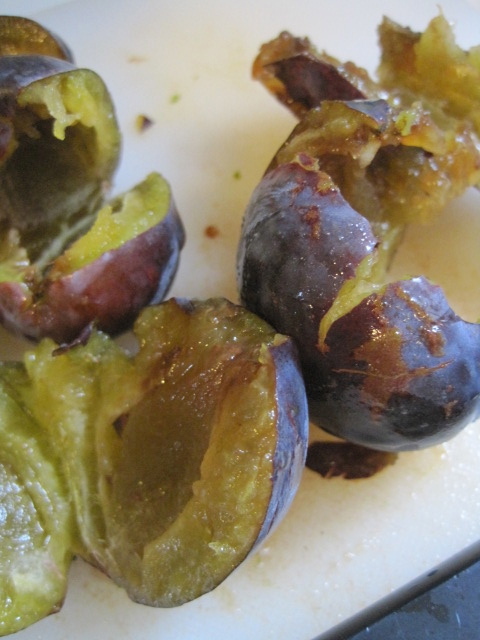 Don’t substitute regular round, juicy plums in this recipe, as it will be too liquid to set. The natural sugar (and apparently, this includes sorbitol, a sugar alcohol that digests more slowly than glucose) is very concentrated, so you don’t need to add much for a safe, tasty jam. And no pectin is necessary, either. You can opt to cook the jam quickly and just until the gel point, or cook it down more slowly, which will deepen the flavor and thicken the jam to a paste similar to the Eastern European lekvar, which uses the same type of plum. We’ve been switching back and forth from lekvar I brought back from Prague and my fresh prune plum jam with abandon, and it tastes like two completely different fruits. I like to add a bit of slivovitz, the notorious plum brandy that also hails from the East. It highlights the plummy flavors in the same manner kirsch does for cherries, instead of providing a boozy flavor of its own. Linda Ziedrich‘s recipe — and I trust her technique all the more when it comes to prunes, having grown up among prune plum orchards — calls for cooking the fruit first a bit before adding the sugar. This will help soften the skins. My version just chops up the pieces smaller, since I like the little bits of skin in the jam. You may adjust the recipe accordingly. The fennel seeds are just now plump and green and ready for drying, absolutely at their prime. I’m sorry if you can’t get fresh ones for the jam because they’re best if you can crush them to a little green pulp. Consider replacing the slivovitz with absinthe or Pernod, perhaps, and pretend you’re in Alsace. Add sugar, lemon juice, and fennel seed to bowl. To maximize flavor and help with floating fruit, let sit on the counter for a few hours, or overnight in refrigerator. Cook down over medium high heat until jam thickens (perhaps 45 minutes? ), stirring very frequently and scraping the bottom of the pot. Wash your jars, rings, and lids, and heat the lids according to the package instructions. 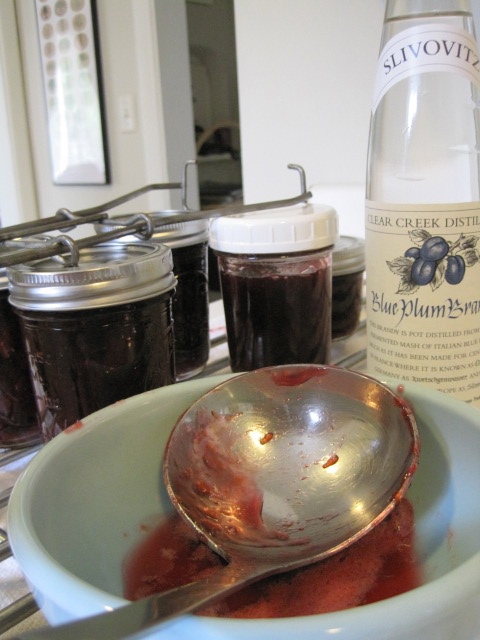 When jam is at set point, remove from heat and stir in optional slivovitz. Spoon the hot jam into jars, leaving 1/4-inch head space. Wipe rims of jars and adjust lids and rings. Process in a waterbath canner for 10 minutes. Thanks for the inspiration. I used (fresh) fennel in a yellow plum jam which is actually rather special. I love experimenting, especially when it works. I love the idea of using fennel in this jam; for years we’ve made the same old conserve using orange rind with our prune plums. Thank you. By the way, in my father’s hometown in Italy they refer to them as ‘Nun’s thighs’.